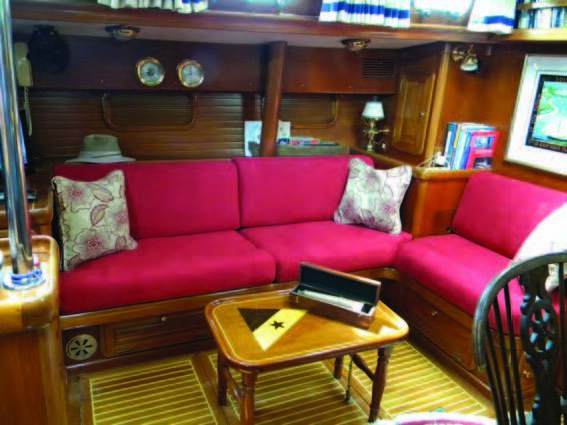 It may seem a daunting task to upgrade and beautify your boat’s interior or exterior cushions on your own, so seek out some help from the experts. If you have been to a boat show recently, you’ve probably seen all the new styles and fabrics currently being used. My advice is to look for a manufacturer that specializes in building cushions for boats. Using their knowledge and experience, you will find there are lots of possibilities to improve the layout and make it more comfortable and they may even have the patterns for your boat on file. You now have options to duplicate the existing layout or make changes in the seating breaks and style of the cushions if the current layout doesn’t work for you. 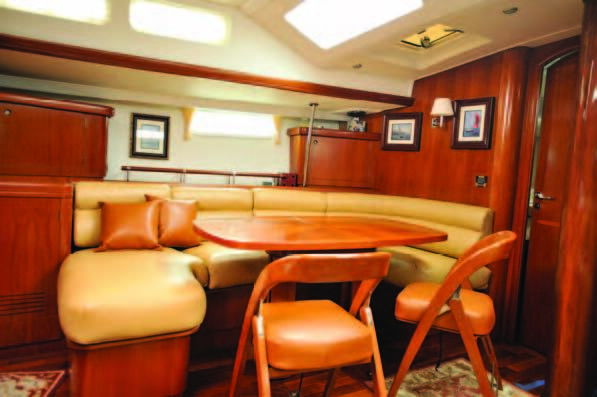 While your boat is wintering, you should plan for your new interior cushions to be ready for the splash date. The manufacturer will typically need about five weeks lead time to complete an interior, plus shipping time to your location. A new interior is ideally built from a pattern of the platforms. Ask your cushion expert if they have a pattern for your boat. If not, it is a simple process to make accurate paper templates of the platforms yourself. It will take two or three hours to template an entire boat of 30 to 40 feet. It is important to template the platforms, and not draw around the existing cushions. The finished product will be more accurate from a paper template of the platform. The old cushions will not be required by the manufacturer if new paper patterns are supplied. This is a bonus if you are a liveaboard because you won’t have to give up your cushions until the new ones arrive! 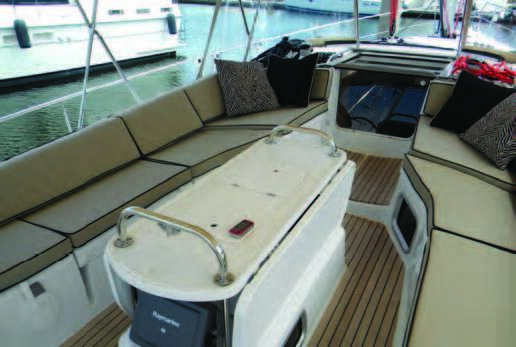 Some V-berths and salon backrests include cushions with upholstered wooden backs or wood insert pieces inside the cushion that often can be eliminated. Island Packet Yachts, for example, traditionally have a board which is upholstered, and these will need to be sent to the cushion manufacturer for reupholstery. Will you be selling the boat in a couple of years? If so, choose a fabric in a “saleable” color: blue or a neutral shade. Sunbrella Furniture Fabrics have plenty to choose from. Adding a contrast color piping can dress a plain color up. Many smaller daysailers in the 18- to 22-foot length can be prettied up using the very practical exterior grade of Sunbrella, giving a water resistant finish with no worries about wet gear down below. Consider using a plain color such as Navy with a Jockey red piping or Aruba for a striking look at a favorable price. Your foam choice does not have to be a high-end product for a boat of this size, and usually 3-inch maximum thickness. Are you a day sailor, weekender, or seasonal boater? Sunbrella Furniture Fabrics offer a huge selection of fade proof and easy-to-clean colors at a reasonable price. There are basic solid colors as well as high-end patterns in these fabrics. 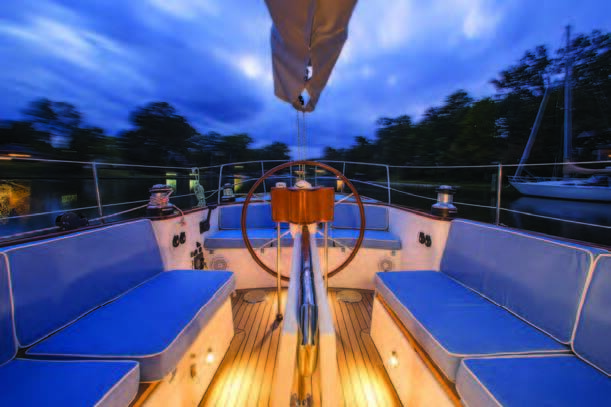 Will you be living aboard or spending many overnights? If so, choose a durable fabric. Ultraleather or Ultrasuede, while more expensive than Sunbrella, will give you a long-lasting, easy-clean, luxury feel for the main salon. Owners of boats that remain in northern waters tend to prefer more traditional, darker colors and fabric rather than Ultraleather. Those cruising boats in warmer climates prefer the Ultraleather and much lighter, brighter colors. Ultraleather Brisa has a breathability rating – it does not get really hot nor really cold, and your bare legs will not stick to it. Stripes work well in the V-berth or aft berth, but are sometimes not so compliant in the main salon where this tends to get too busy. Your cushion expert can help you in selecting a fabric to co-ordinate the stripes with a plain color in the salon. Try adding 16”x16” or 18”x18” throw pillows for the cabin in the coordinating stripe instead. Adding buttons is not as popular is it once was. Having buttons means you cannot take the cover off to wash it, although a few buttons on a plain backrest does add some detail. Foam comes in a few grades, so choose the liveaboard quality for a long-lasting cushion. A good choice is 2.3-pound density foam with 50 lb. compression for seats, and 30 lb. for backs. A common depth for a seat cushion will be 4 inches. I highly recommend this foam density for liveaboards, or if you spend many overnights on your boat or sail year-round in the warmer climates. Adding a curved corner backrest will add a little more luxury on an L-shaped or U-shaped dinette. Options for the style of the seating vary from raised knee rolls, backrest wedge shapes for more back support, or plain modular seats with or without piping. In the sleeping berths you have more options for comfort. As long as you have no obstructions, a Catalina 30 V-berth, for instance, can accommodate a 5” foam mattress with 2” of memory foam for an exceptional night’s rest as well as giving you extra width as the foam grows on each side of the hull! Recommended fabrics for sleeping berths are the Sunbrella Furniture Fabrics or, if you want a softer feel, try the Microfibers. Or put the same fabric throughout the interior for a clean look. Your boat cushion expert will also be able to make fitted mattress pads, sheets and cut down coverlets for these berths. You supply the linens (flat King-size sheets), and they cut to fit the mattress. You’ll usually find the best pricing at special events and boat shows. You should expect to spend anywhere from $1,700 for a small boat to $6,000 or more for a more luxury interior in a mid-sized boat. Shop around for pricing but be sure to purchase from a reputable, experienced company with a guaranteed product and after-sale service. Seat cushions made with 2” closed cell foam (flotation foam) are the most practical, and they will not absorb any water. This foam will provide you with a stable platform for standing or kneeling on, and holds up well in the weather. Zippered covers in Sunbrella Exterior Grade, Phifertex Plus, Sunsure (a fine mesh product) or Marine Grade Vinyl all work well on closed cell foam. In the case of Vinyl, you may want to consider having a textilene mesh on the bottom to allow any water to escape if it gets in through the seams. Another softer exterior foam is Drifast. Most commonly used in 2” or 3” thickness, this foam has an open cell structure that allows water to pass right through it. Unlike regular polyfoam, Drifast will not absorb water. Sunbrella, Phifertex Plus and Sunsure mesh covers work well with this product. Aside from the exterior grade fabrics, if you have a fairly well enclosed cockpit, any of the Sunbrella Furniture Fabrics (indoor/outdoor) and also the Fusion Sunbrella Fabrics can be used over the Drifast foam for a more luxury feel. These fabrics are not water resistant, but are fade proof and will dry quickly in the sun. If you require attachments, snaps and screw studs are the most common form of fasteners, although there are now self-adhesive white plastic snap studs called AddSnaps which are easy to install and require no drilling – just clean the surface, peel and stick. The discs usually attach to the smooth, front vertical face of the seat. The female snap button is inserted into a small U-shaped tab sewn to the bottom seam of the cushion. If no snap attachments are required, I suggest using a no-slip matting under the seat to stop slippage. That means you can flip your cushion from one side of the boat to the other and get better use of both sides of the fabric (if the cockpit seats are the same size on each side). Attaching a forward cushion with a hinge is a good idea for stepping in and out of the boat to improve stability and wear on the cushion. Just flip it back when you are boarding. The rail seats will need attachments with straps and snap buttons to attach under to the screw studs. Likewise, often the helm seats should be attached where there is low coaming to prevent them blowing away. If you need better forward visibility from the helm, consider a Hump Helm cushion. Usually these will be 7-9” in the center and can be a flat-top or curved. Light colors in Sunbrella, such as Natural and Linen or Parchment, might look very attractive but you will be cleaning them often. Contrast color piping can be added, either in a coordinating color or to match the bimini. Dark colors like Navy or Captain Navy will get very hot in the tropics, although most boats in northern climates are fine with these colors. If you require some back support, think about having 20” x 20” signal flag pillows which are made sham-style with exterior Sunbrella for a colorful and fun addition. Choose the letter for each member of the family. These you can easily throw down below if you get in a blow. Fixed backrests can be a hindrance if you encounter a sudden squall. For ultimate luxury (which comes with a higher price tag), this may be what you are looking for if you entertain a lot in the cockpit. As with any boat cushions, seek out the professionals who may have your layout on file. If not, cockpit cushion patterns are easy to make. Remember to always make the template from the platform and not from existing cushions, which tend to shrink. If there are existing screw studs for attachment, these can be identified on the pattern. If the cushion manufacturer you choose is not in your state you will have shipping costs, but sales tax will usually not be collected if the cushions are shipped outside their state, and shipping costs are less to a commercial property than a residential one. Jane Vanse is a Cushion Consultant at Island Nautical in St. Petersburg, FL. For more information, visit islandnautical.com.